Prominent & Leading Exporter from New Delhi, we offer custom mdf design wooden folding tea table, mdf digital tray sets, mdf digital sets gift packaging, mdf digital tray and mdf decoration dustbin for hotel room. 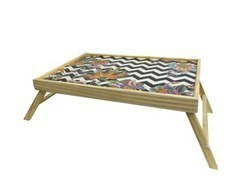 This bed tray is made of premium bamboo and MDF, stable and sturdy. You can use it at bed to have breakfast, enjoy a cup of tea or do reading. It can also function as a serving tray when folded the four legs. You deserves one for leisurely lifestyle. Turn your tea time into a magical soiree with the Magic Kingdom tray. 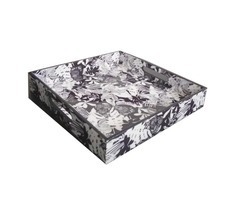 Rectangular in shape, the tray is made of MDF and is a pretty sight. The design has elements of tropical nature with palm tress arranged in a criss cross fashion. Alluring and graceful, the design adds a completely different demeanor to an otherwise plain tray! Manufacturer and supplier of handicraft items. We bring premium quality products to our valuable customers and keep trying to provide best services every day. 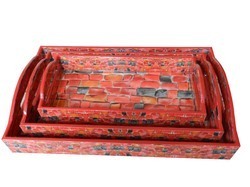 This beautiful tray is made of MDF and designed by hand, MDF is good with respect to resisting changes in vivid climatic condition and is more strong and compatible then solid wood. Printing of different images gives a unique and elegant looks. These trays are painted and polished by hand and look nice when you actually see in your hand. Backed by an adroit team of professionals, we are offering a mesmerizing assortment of Wooden Dustbin. These dustbins are designed by our professionals using supreme quality material and are also strictly examined on several parameters to make sure matchless quality in relation to finish and design. Our offered dustbins are highly appreciated for their perfect finish and precise design. Moreover, these are delivered to our esteemed patrons within the committed time frame.